Oil on canvas, 80 x 135 cm. Heinrich Hansen was the first Danish artist who exclusively specialised in architectural painting. 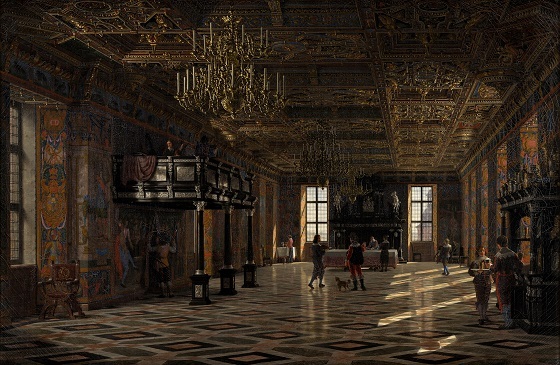 In this painting, the artist sought to reproduce the great hall at Frederiksborg Castle as it looked under the reign of the Danish King Christian IV. Several staffages in Renaissance-period clothes are included to emphasise the historical framework of the painting. In the same year the painting was completed, a great fire destroyed large parts of the interior of the King’s Oratory, The Rose and Great Hall. The interior details from the artist’s architectural studies were particularly useful in the subsequent reconstruction efforts.